I discovered St. Pete Rocks when I found a painted rock in Crescent Lake Park. On the back of this lovely little piece of art, it said, “Please post on FB @st.peterocks, then re-hide, or keep.” I took the rock home with the intention of doing exactly that; take a picture, post it on Facebook, then re-hide it. Little did I know that this would be the start of a creative endeavor for me. My first attempt at painting a rock was not successful, since I used what I had on hand, nail polish. Definitely not my best work. Within weeks after this failed attempt, I went to the Earth Day Festival in Williams Park and saw a booth with ‘rock’ artists painting up a storm, both adults and kids. That’s also where I met Kim Laskey, the creator of St. Pete Rocks. My stpeterocks painting started in earnest after I talked to Kim and she directed me to the group’s website, stpeterocks.org, and to the Facebook page. I learned about what supplies to get and where to get rocks. I now had cheap acrylic paints in many colors from Walmart, brushes of all shapes and sizes, and a bag of beach rocks from Home Depot. Since I’ve started painting rocks, I feel my creative juices starting to flow again. And I love the thrill of the hunt for rocks hidden in crevices and in plain sight all over St. Pete. 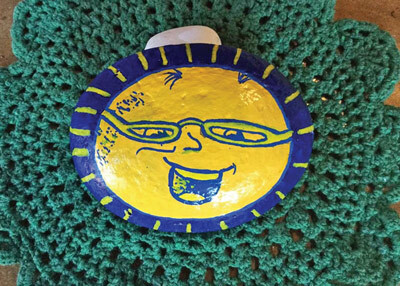 Kim started St. Pete Rocks in November of 2016, after visiting a friend in Lakeland who was a member of Lakeland Rocks. When she saw what was happening in Lakeland, she was inspired and thought “Oh, I would love to do that in St. Pete.” Because of her own interest in art, and since St. Pete has such a vibrant arts community, with so much art on display everywhere, she figured that St. Pete Rocks would catch on and grow. But, it took a while. For four months, Kim painted 30 or 40 rocks each week. Then, every Sunday she would walk around downtown St. Pete and hide her rocks everywhere she went. While she was painting and walking and hiding, she was scoping out other ‘rocker’ communities on Facebook. It was there that she got the idea to hide the rocks in St. Pete area parks. It was a natural; people go to parks, take their kids, their families, have picnics, walk their dogs. They would see the rocks hidden in trees, bushes, by the lakes, on a bench and be delighted when they found these lovely, fun, silly, inspirational pieces of art, while enjoying nature. Hopefully, they would then be inspired to do the same – take the rocks home, post the pictures on Facebook, then re-hide them and paint some of their own. Channel 10 News heard about this creative community and aired a story about the group in March 2017. Since then it’s just grown exponentially; first Kim and 100 of her friends, until there are now 32,000 members at last count. Why not join us? It’s like a little treasure hunt, but without a map. Awesome! I was inspired when I found a rock in St Pete which travelled with me to CT. Since then I researched, found, & joined CTRocks. So much fun!